Back in 2008, Andy Ricker, chef/owner of Portland, Oregon restaurant Pok Pok, was kind enough to share with me his favourite khao soi restaurants in Chiang Mai, which later became the basis of a magazine article I did. During our 'research', we made a couple attempts to visit Khao Soi Prince, one of his top places and a restaurant I'd heard about but had never eaten at. Unfortunately Prince was closed for Ramadan, and on subsequent solo visits to Chiang Mai, the restaurant was always closed for one reason or another. Well it's unfortunate that it took me so long to get here, because even after my first and only visit last week, Khao Soi Prince is now one of my favourite places to get a bowl. Named after the nearby Prince Royals College, Prince is a longstanding Muslim restaurant that also does biryani and some rich-looking curries. 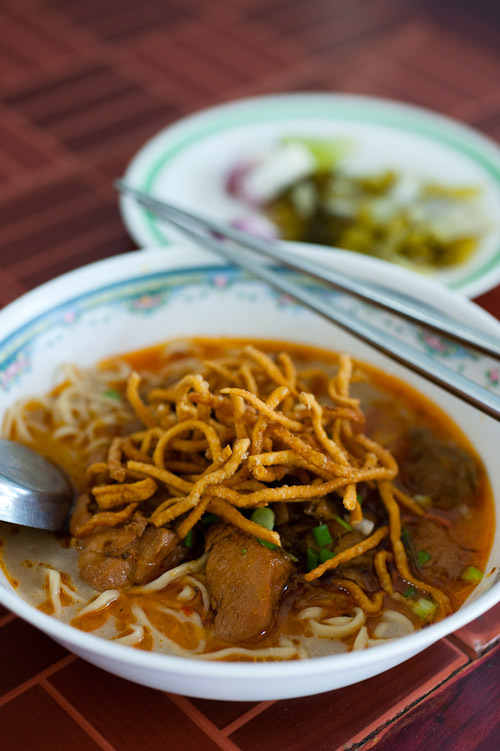 The khao soi kai, chicken khao soi, is a bit unusual in that rather than the single chicken leg that most places use, Prince uses seemingly marinated chunks of breast meat, a bit of brown meat, and what appeared to be some very tender liver and/or blood. Despite its somewhat thin and watery appearance, the curry broth here is actually very rich and fragrant with the taste and smell of dried spices. And to top it off, they even use the good-quality pickled mustard greens topping. And speaking of Andy, news just came in as I was about to post this that Ricker won Best Chef Northwest in the 2011 James Beard Foundation awards! Congrats, Andy - looking forward to celebrating over a bowl at Prince next week!